Just wanted to let everyone know about a few books that I’ve found recently that are very helpful in understanding WHY to build your passive solar tire bale home a specific way; why to do your research before you design or build, and why to use an experienced architect or designer in these types of houses. I’ve been doing research for our book, which I cannot tell you when will be complete, only that I am working on it. The Solar House Passive Heating and Cooling by Daniel D. Chiras, 2002, Chelsea Green Publishing, White River Junction, VT, ISBN 1-913498-12-1 paperback. This book is helpful in understanding how to supply heat sustainably, energy efficient design, indoor air quality, types of wood stoves, windows(!) and their coverings, orientation and so much more. The Passive Solar House The Complete Guide to Heating and Cooling Your Home, by James Kachahadorian, 1997, 2006, also published by Chelsea Green Publishing, White River Junction, VT, ISBN 1-93392037-03-7. This book has some of the most basic things to understand when undertaking a passive solar home. It also has some of the best formulas needed for this type of architecture. This has been one of my best resources! Solar House Basics by Peter Van Dresser, Passive Solar House Basics,, 1977, 1979, 1995, Peter built his first solar home in the early 1950s. This is my 2nd best reference for passive solar homes. I love the illustrations and the brevity but all the very good information. Passive Solar Buildings Solar Heat Technologies: Fundamentals and Applications, edited by J. Douglas Balcomb, 1992, MIT Press. (part of a 10-volume set). Balcomb is one of the key figures in many areas of passive solar heating and cooling technologies and on the formulas that many architects must know when designing these types of homes. He also works with the Passive Solar Industries Council. There is some information on performance modeling in this book that may also be found in materials from the American Solar Energy Society (ASES). As I reflect back on our building experience, I have found that if I had a checklist of very important data to keep in mind when designing our home and then building it, we would rate about 80% of doing what these authors have recommended for this type of architecture. For instance, there is a sort of checklist outlined in a chapter in the last book called “Elements of a Passive Subsystem”. 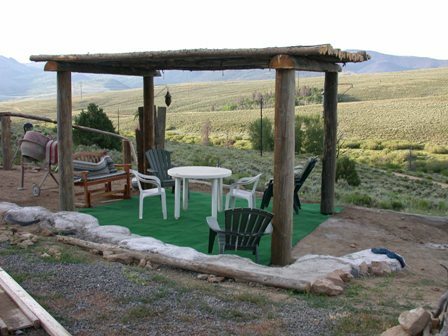 Check this out as you design or build your passive solar tire bale home. You will find that it will save you money in the long run. Thanks to the visitors who took time to listen us explain and brag a bit about our accomplishments with our passive solar, thermal mass home whose structural integrity is made from 170 tire bales (over 17,000 used tires). We also learned from our guests of their projects, which was another exciting part of our day…the exchange of ideas. We discovered that we are not the only “different” people out there. Thanks also to the people at Grand County Business Economic Development Association (GC BEDA) and American Solar Energy Society (ASES) for putting this tour together and sponsoring it. Mark your calendars for next October for the next ASES Solar Home Tour. The interior of our tire bale home is about 98% complete. The guest shower is now complete. Now all we have to do is add blinds to the east end of the house to be 100% complete. We’re hoping to have the money to add the blinds this year. Exterior work for our home included adding a solar system this year, which we completed on 7/27/2010. It is almost paid for before proceeding with the last interior item. Also on our list this year for exterior work was the addition of a pergola. We will be opening our home as part of a partnership with Grand County Business and Economic Development Association (BEDA) and American Solar Energy Society’s (ASES) National Solar Tour on <b>Saturday, October 2, 2010, from 10am until 3 pm.</b> If you are interested in participating in a tour of our home, you MUST sign up by going to GC BEDA and ASES Solar Tour and pick up a map there also. We will have displays which will discuss thermal mass, passive solar homes, as well as solar systems like ours, and energy graphs for our home to see energy savings. Plan the day to visit different solar homes and see solar techniques to discover which one(s) interest you the most. Update on our solar system…it’s working! As of today, we have generated 640Watts or 14kWh (kilo Watt hours). Whoopee! A clarification must be made here. We choose NOT to be off grid. Why? Batteries–toxic, non Earth friendly, and they require maintenance. Instead we choose to manufacture our own energy (small at first) and feed it into the grid. This method effectively offsets our electric bill. To afford the system, we took advantage of rebates from the Colorado Governor’s Energy Office (GEO) and Federal tax incentives to offset nearly half of the price of our system. We feel it was worth the investment. The solar panels are now mounted on our pole rack system. 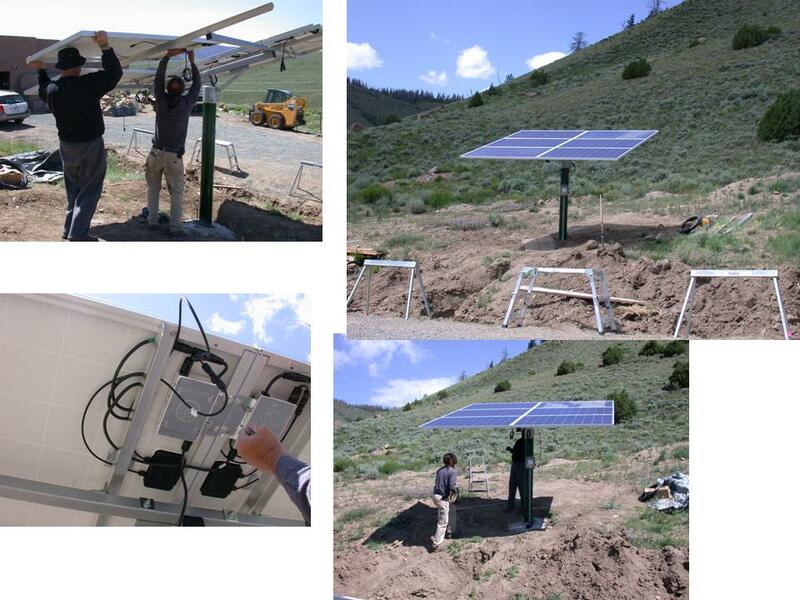 Guy Larson and Duncan place panels on our pole mounted solar system. Guy shows us how the microinverters are wired. 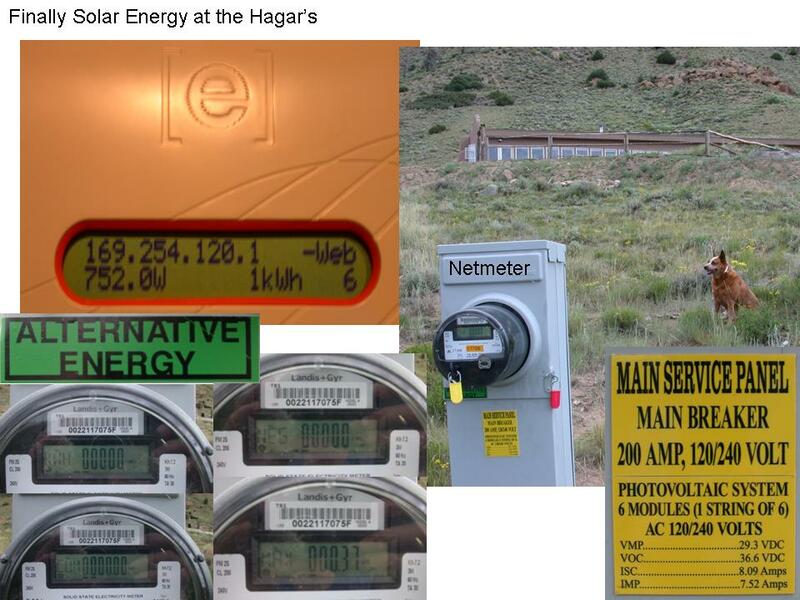 Our Netmeter is ordered from Mountain Parks Electric. We are just about to reap the rewards of our solar system. Hooray!! Catch the next post on how much the system generates. A newsletter from Ed Begley (Living With Ed) today discusses a new type of wind turbine from Enviro Energies (of the U.S. and Canada) that has strong potential for businesses as well as homeowners. How a system like this will work in our snowy mountainous climate is yet to be determined. A check with a local installation contractor reveals that our winds here in Grand County Colorado are not consistent enough for this type of turbine. It is pricey, but so was solar once upon a time. 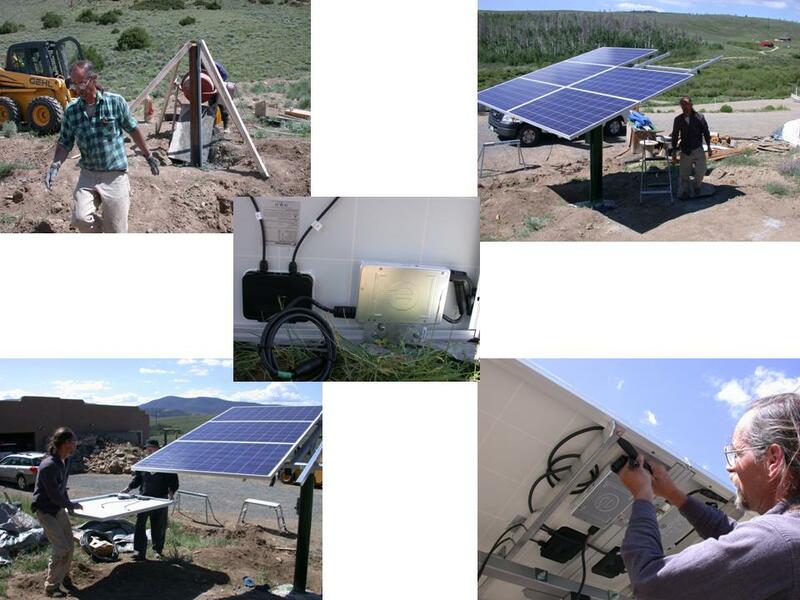 For Enviro-Energies 10 kW MVAWT — Rated output of 10 kW and maximum output of 12 kW. Can be utilized in most wind conditions. Power generation in as low as 4 mph of wind. MSRP does not include any taxes, installation and/or shipping/ handling costs and are subject to change without further notice. Read the specifications. See if it will work for your home or business. There are still Renewable Energy Rebates available from the Colorado Governor’s Energy Office (GEO) and the Federal Government to assist with some of the costs (including installation).